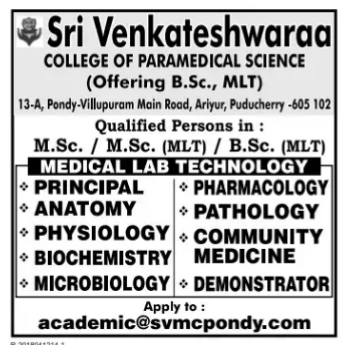 Sri Venkateshwaraa College of Paramedical Science, Puducherry has advertised in THE DINAMALAR newspaper for recruitment of Teaching jobs vacancies. Interested and eligible job aspirants are requested to apply immediately. Check out further more details below. Sri Venkateshwaraa College of Paramedical Sciences is a visionary tailored to prepare the students for the challenges of patient care in 21st century. Sri Venkateshwaraa College of Paramedical Sciences is committed to being a leader in advancing human health care through the integration of education, patient care, research, and community service. Sri Venkateshwaraa College of Paramedical Sciences is located at the outskirts of Pondicherry on the industrial corridor connecting Pondicherry and Villupuram It is a proud result of the long standing vision and hard work of our Chairman and founder who with their untiring efforts and determination started the medical college which has now sprouted with different courses and colleges.